The microKey offers 37-note, velocity-sensitive playability. Korg's microKey comes with a bit of history, which bears repeating here. When we took a look at Korg's ultra-compact nanoSeries range of controllers a couple of years ago, we felt that two out of three of them - the nanoKontrol and nanoPad - hit the mark spectacularly well. However, the third - the nanoKey - impressed us less. Small and affordable it may be, but the nanoKey is a MIDI controller keyboard that falls down in one crucial respect: it's barely playable. The keys feel like they've come off a laptop, they've got very little travel, and the black ones are the same size as the white, which feels most unnatural. Our feeling was that Korg should have taken inspiration from its microKontrol keyboard and made a compact controller with proper mini keys, and thankfully, with the microKey, that's exactly what it's now done. This is a 37-note, velocity-sensitive 'Natural Touch' keyboard that keeps things very simple: pitch/mod wheels and octave up/down buttons are the only additional control features. 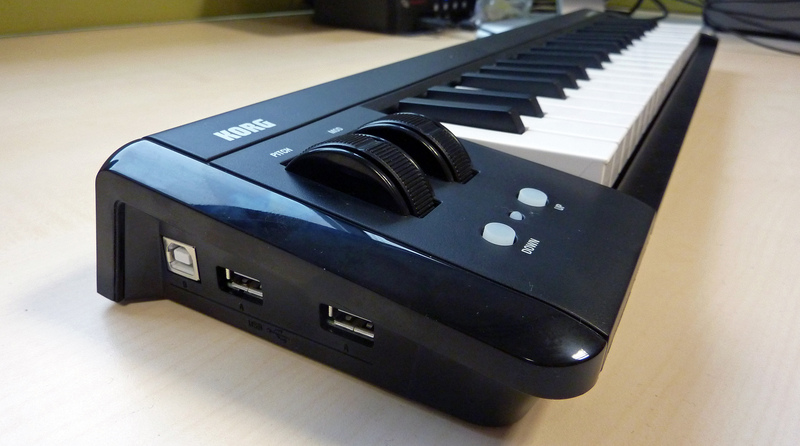 The USB connector is side-mounted (there's no standard MIDI output), and a further two USB ports mean that the microKey can also serve as a hub. This will be useful for port-starved laptop users, who this keyboard will most definitely appeal to. That said, the microKey isn't quite as small as you might think: checking in at 565mm long, 139mm deep and 54mm high, it goes way beyond the width of a laptop. 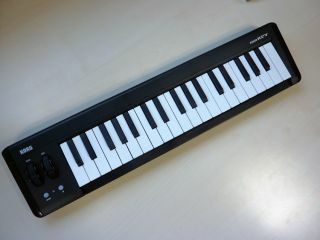 The good news, though, is that this slightly larger form factor means that you get a keyboard that you can actually play; the keys may be of the mini variety, but if you want to do anything other than input simple bass or lead lines, having three octaves of them makes a massive difference. Of course, another option would be to go for one of the many 25-note models that have full-size keys. Keyboards with this spec are more playable, but the trade-off is a very limited range. We should mention that the microKey's mod wheel can be re-assigned to send control change messages via the freely downloadable Korg Kontrol Editor software, which also enables you to specify the MIDI channel that data is sent on, the keyboard velocity curve and (if any) the transpose setting. A factory reset can be performed by holding down the octave up/down buttons while you turn the microKey on, but that's as far as hardware editing goes. Supplied software includes Toontrack's EZdrummer Lite, AAS's Lounge Lizard Session, and Korg's own M1 LE. There's also an Ableton Live discount coupon. 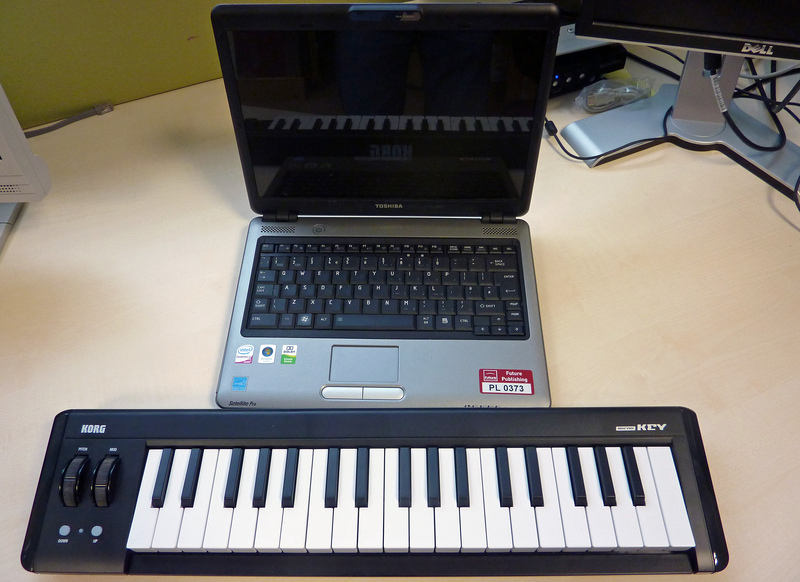 The microKey provides mobile computer musicians with another welcome controller keyboard option. At £82, it's possibly £20 more than you'd like it to be, but you may be able to shop around and get a better deal. If you're happy with 25 mini keys, Akai's LPK25 is also worth a look but, for us, having a full third octave and proper pitch/mod wheels tips the balance in the microKey's favour - even if we will have to buy a slighter bigger bag to accommodate it.